Certified Green Team provides professional curtain cleaning for both residential and commercial clients. We have been in business since 2009, specializing in dry cleaning curtain and drapery fabric. Our on site dry cleaning service removes dust, smoke, pollen, odors and soil from all fabric types. Don't overlook your curtains when it comes to cleaning. Call (617) 586-2586 for quality curtain cleaning. Certified Green Team has been in the curtain cleaning business for more than 10 years. 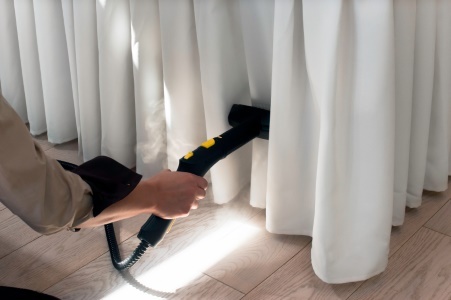 We clean all types of drapery and curtain fabric, using equipment that is specifically designed for drapery. We offer the convenience of on site service so your home or office is not exposed while your drapes are cleaned. For expert curtain cleaning, call (617) 586-2586. Maintaining a clean and healthy indoor environment is important for homeowners and business owners alike. So don't forget about your drapes and upholstery when it comes to cleaning. Drapery and upholstery fabric absorbs odors, gets dirty, and attracts allergens like dust mites. However, most drapery and upholstery fabric cannot be laundered; it must be professionally dry cleaned. Certified Green Team has been in the drapery cleaning business for more than 10 years. Call (617) 586-2586 to find out how convenient and easy it is to have your curtains professionally cleaned by Certified Green Team. Certified Green Team recommends regular drapery and upholstery cleaning in order to preserve the fabric's color, appearance, and texture. For professional curtain and drapery cleaning with impeccable results, call (617) 586-2586. The Certified Green Team dry cleaning process won't damage or shrink your curtains. The result? Crisp edges and hems, parallel pleats, and clean lines.